Free download Andriller latest version. 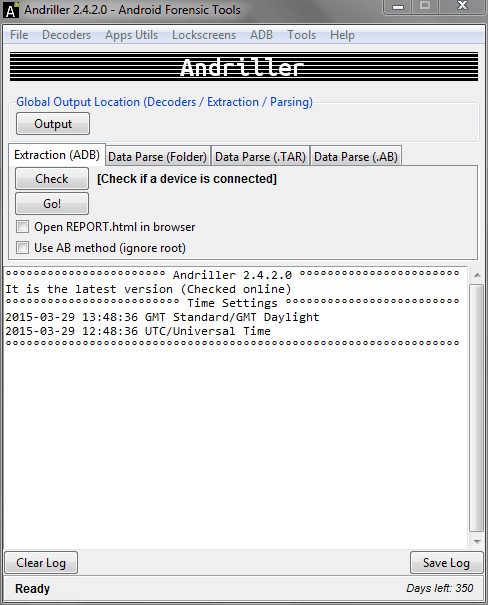 Andriller – is software utility with a collection of forensic tools for smartphones. It performs read-only, forensically sound, non-destructive acquisition from Android devices. It has other features, such as powerful Lockscreen breaking for Pattern, PIN code, or Password; custom decoders for Apps data from Android (and some Apple iOS) databases for decoding communications. Extraction and decoders produce reports in HTML and Excel (.xlsx) formats. Andriller comes as a lightweight Setup installable for Windows (XP,Vista,7,8). It only requires Microsoft Visual C++ 2010 Redistributable Package (x86) installed, USB drivers for your Android device, and a web browser for viewing results. Simple. Database Decoders feature allows importing individual App database files for automated parsing of the data. There are decoders mainly for Android and some for Apple iOS Apps. Once successfully decoded, reports will be shown your web browser. Databases can be exported from mainstream forensic tools, such as XRY, UFED Cellebite, Oxygen Forensic, and imported into Andriller for individual decoding. The output from Andriller offers cleaner output data.